The Winter 2019 issue of The Cascadia Subduction Zone is out. 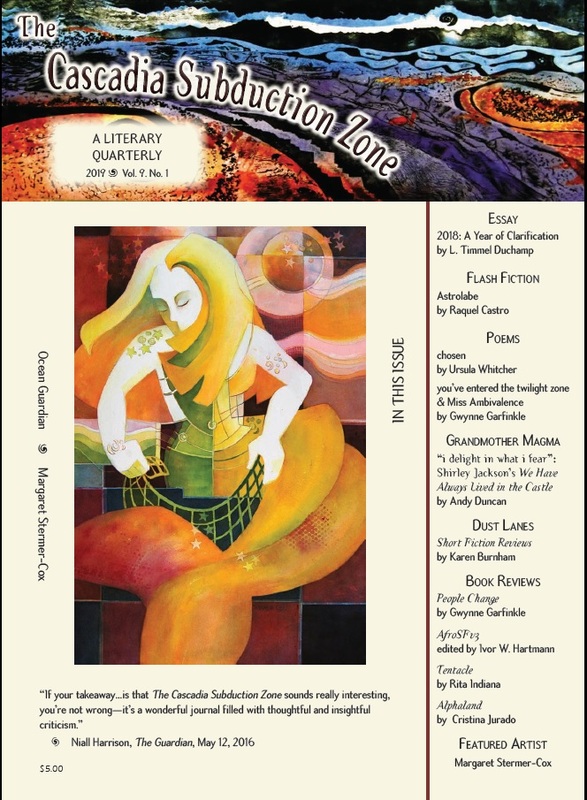 The issue includes short fiction by Raquel Castro (tr by Lawrence Schimel), poetry by Gwynne Garfinkle and Ursula Witcher, an essay by L. Timmel Duchamp, a Grandmother Magma column on Shirley Jackson's We Have Always Lived in the Castle by Andy Duncan, short fiction reviews by Karen Burnham, and book reviews by Kathleen Alcala, Nisi Shawl, Cynthia Ward, and Arley Sorg. Our featured artist is Margaret Stermer-Cox. You can purchase single copies or subscriptions at http://thecsz.com/; the electronic edition is $3 for an issue or $10 for a year's subscription, while the print edition is $5 for an issue or $16 for a year's subscription.